Foodies rejoice! 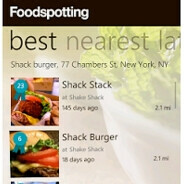 FoodSpotting has finally made its way to the Windows Phone 7 Marketplace. FoodSpotting is one of those weird little hybrid apps that has garnered a strong following, and is generally pretty awesome. 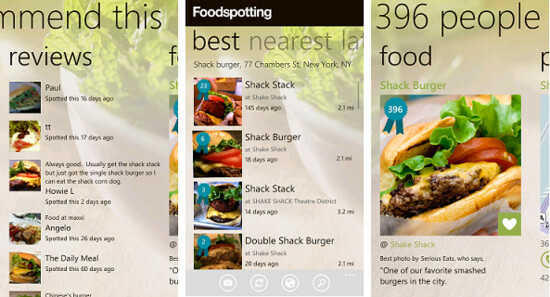 Essentially, FoodSpotting is a mashup of Yelp and Instagram, but focusing on food. The idea isn't just to find good restaurants around you, but to find exactly the food you want. FoodSpotting allows you to take pictures of your meals and share them with mini-reviews of the restaurant that you're at and also share foods that others have recommended. But, the big value is in finding new places. You can find highly rated and recommended restaurants near your location, search for a specific kind of food, or just browse. You can browse restaurants and see the photos others have taken, and even bookmark foods and restaurants that you want to try later. If you enjoy exploring new restaurants, and finding new food, or even just sharing your own food experiences, FoodSpotting is a solid app that already has a good following of users and a great database of locations to draw from.